Our company is a locally family owned and operated business. We have been in business for 30 years and strive to be the best in the industry. We offer competitive rates for both personal and company needs and you are sure to find the right product for your storage needs. 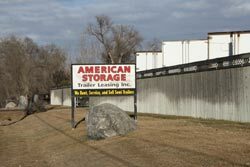 We have an 11 acre storage lot and our own semi tractor for deliveries. Our experienced driver and staff are here to help you, so please contact us today!